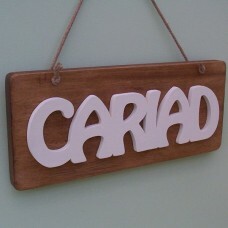 This hanging hand made wooden CARIAD sign has a rustic finish and looks great in a traditional or modern home. The back board is made from solid wood, has a really chunky feel and the antique waxed finish gives it that rustic look. The lettering is hand cut from 1cm thick quality birch plywood and has a creamy paint finish which makes it stand out from the board. The rope attached to the board a.. 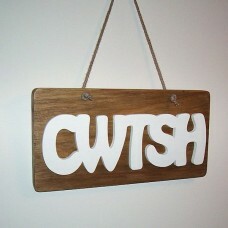 These hanging hand made wooden signs are available in either CWTCH or CWTSH. They have a rustic finish and look great in a traditional or modern home. The back board is made from solid wood, has a really chunky feel and an antique waxed finish to give it that rustic look. The lettering is hand cut from 1cm thick quality birch plywood and has a creamy paint finish which makes it stand out from the ..
Chunky wooden hand painted pastel coloured flowers with raffia ties. The middle of the flower has a separate wooden piece which is also painted in a different colour. A great decorative item for hanging off bed posts, cupboard and door handles, drawer knobs, etc.Colours : Lemon, Lilac, Pink, Mint, Peach. Size: Small 7cm x 2cm thick , Large 9cm x 2cm thick Please note these are not toys and..
Chunky wooden hearts with raffia ties which are available in different colours and sizes. The large heart is made up of 2 wooden different coloured hearts, it has a chunky outer heart and a thinner smaller heart which is raised giving a 3 dimensional effect.The small heart is painted in one colour. The main image shows the large heart. Size: Small 6.5cm x 6.5cm x 1.5cm thick, Large 8.5.. 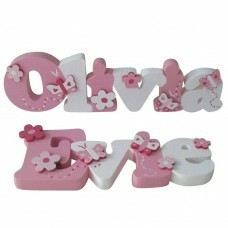 These hand made wooden names are painted in pink and white and then decorated on the front with butterfly and flower cut outs giving a 3 dimensional effect. They are thick enough to stand on a shelf in a girl's bedroom/playroom or they can be used as door plaques.Names are priced £1.80 per letter, please ensure the name entered in the 'Name Required' box corresponds with the number of letters orde..
A new design for 2017 this handmade free standing sign is made from solid wood and then given a medium oak wax finish. The letters are 28mm thick which gives them a really chunky feel. Great for displaying on a wooden beam above a fireplace, window board or shelf.We can either make as CWTSH or CWTCH, choose you preferred wording from the drop down box below.Size: 15cm high x 2.8cm thickThe letters.. These free standing Welsh words are made from solid Welsh Ash and are given a natural wax finish to enhance the beauty of the grain. Each word is individually cut from a solid piece of wood making each one unique. Please note as these are made from a natural product the grain will vary from images shown.Choose the word required from the option box below.Size: 7cm high x 2.5cm thick, words var..
Our personalised chunky wooden hearts are made from solid hardwood and are given a natural wax finish to enhance the beauty of the grain. A great decorative feature for any room in the house. These hearts are a perfect keepsake gift for weddings, anniversaries or any special occasion.The hearts can be personalised with any name/word. See the images for different examples.Size: Large 12cm high x 12.. These chunky freestanding names are made from solid ash and then given a natural beeswax finish. They look great on a shelf, wooden beam, etcPlease note the names are handmade from a natural product so the grain will vary making each one different and unique.Size: 7cm high, names vary in length depending on the name ordered e.g. Elin is 19cm long. Names are priced £2 per letter, please ensure the ..